Or, how to reveal a private note but only to friends who consider themselves close. tl;dr: To share mostly private info on Facebook with Friends how have opted-in to caring about you, post the private info to your Timeline with the Friends share setting, then promptly delete the post. I noticed the viability of this technique when a friend revealed that his cancer test came back not-so-good, but accidentally posted the note to all his Friends instead of just his Close Friends. He quickly deleted the post and most of his Friends never noticed, as his post disappeared from their Feeds. But I noticed because I consider him a Close Friend, so I get an email notification as soon as he posts anything, even if it has since been deleted from his Timeline. There are several methods to share privately with Friends, each with slightly different degrees of privacy and sharing. 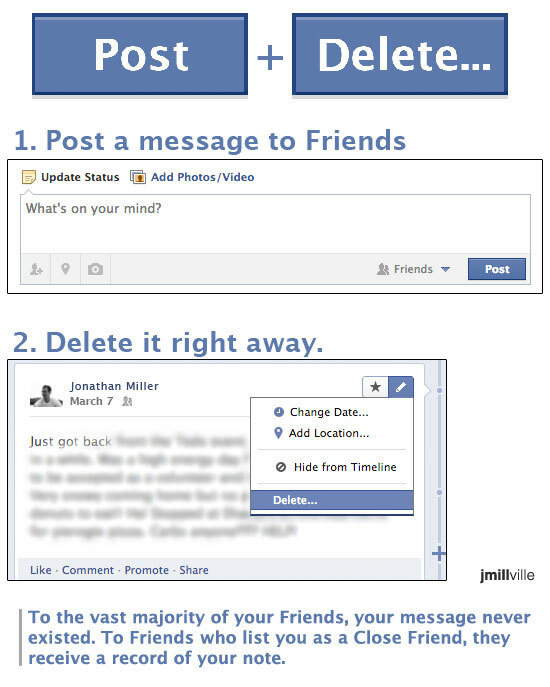 The first two methods are built into Facebook. The third method (the reason for this post) is a bit different. Jump to Method #3 if you’re in a hurry. With Facebook, the traditional way to share info among a group of your Close Friends is to assign “Close Friends” in the share setting, as seen below. When you choose “Close Friends”, an explanation appears. This creates a list in which Close Friends on the list can see each other’s names. This is fine for some situations and may be sufficient for you. But perhaps you don’t want them to see each other’s names. You can write a message to each and every individual. This has very granular control and is good for keeping things very secure (well, more secure, but still not very secure). A different approach, for different types of conversation. This is a new approach that is similar to Method #1, except it is opt-in for each Friend, rather than you selecting each specific individual. It’s the reverse of Method #1. Instead of you deciding who should know what about you, let your Friends decide whether they want to keep abreast of each detail of your life. Friends who have you on their Close Friends list (regardless of whether they are on yours) will receive text/email with your message. For friends who do not have you listed as a Close Friend, there’s only ~1 second (depending on how fast you delete) for them to view your message on their Feed. Post+Delete could be useful for sharing info with your most personally engaged Friends (as determined by their interest in your posts, rather than the interest you perceive them to have). Share a draft of your new book with a limited audience, tell an embarrassing story, or provide an opportunity for individuals who feel close to you — but who you never realized felt that way — support you through a tough time. What may be appropriate times to use the Post+Delete method? Have other suggestions? Let me know: jonathan at jmillville dot com. For those concerned about my friend, things are looking okay so far. Several doctors are keeping watch on his health. Thanks for being concerned. The Close Friends notifications can be adjusted.